Summersalt, situated at the gorgeous Jumeirah Al Naseem, is definitely one for the Dubai bucket-list. Although perhaps not your regular tanning spot (entrance has previously been quite pricey), the beach club has now introduced a ladies’ day offer that won’t have you taking out a bank loan to cover it. Every Monday, ladies can now spend the day at Summersalt and pay Dhs100 for the day. You’ll also receive a refreshing welcome cocktail, a sun lounger, access to the shower facilities and a cool 25 per cent off food and drink. 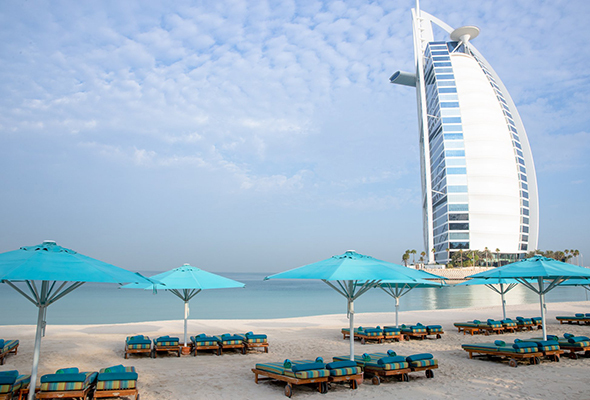 You can lounge by the pool or hang out at one of Dubai’s most exclusive beaches, and take advantage of one of the best views of the Burj Al Arab -which can be beat only if you get on a boat. It is quite literally under the shadow of the Burj (don’t worry though, it won’t stop your tan game). As the weather gets warmer in Dubai, now is the perfect time to top up your tan before summer hits. Summersalt’s pristine white sandy beach and perfectly-cooled swimming pool will make the perfect backdrop for your next top-liked ‘gram photo. Aside from the ladies’ day offer, Summersalt has dropped its prices for the weekdays and weekends too. Now you will pay Dhs200 in the week and Dhs375 on weekends which includes water, pool and beach access, a sun lounger, the shower amenities and 25 per cent off food and beverages. If it’s a more luxurious experience you’re after, check out the VIP package which offers one bottle of house rosé wine, a fresh fruit platter and a set-menu lunch or dinner at Japanese fusion pop-up concept, Umi Sho. The price of the package for two people is Dhs895 on weekdays and Dhs1,095 on weekends. Looking for more ladies’ days? Check out our guide to 18 of the city’s best.